On this day in 347, St. Jerome was born, and while I’m no longer a Catholic, I fondly recall taking Jerome as my confirmation name when I was a boy (that was already my baptismal name). I thought it was cool that he translated the Bible into Latin, as that seemed to me such an impossible task. As a young adult, I learned the story of Jerome ‘s taming a lion by removing a thorn from his paw when Jerome appeared with a lion on the cover of Tom Regan’s The Case for Animal Rights. 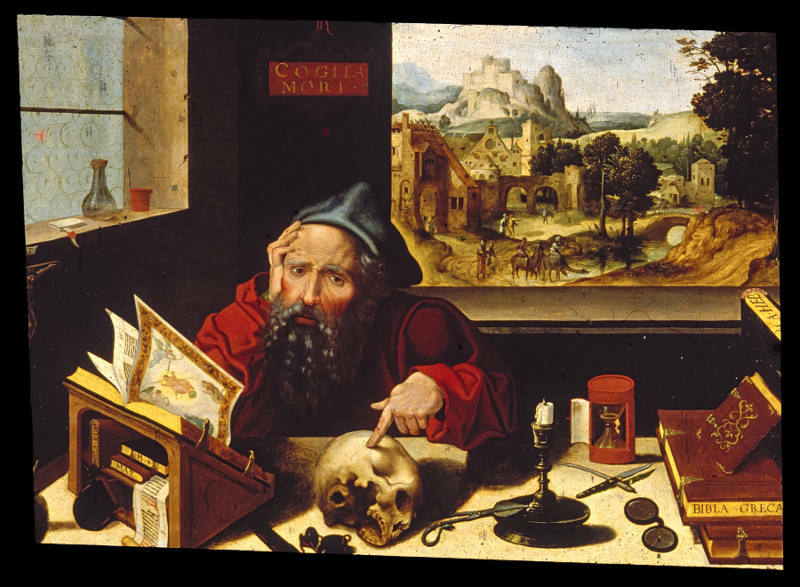 In the painting of Jerome shown above, “the admonition that Jerome has fixed to the wall, ‘Cogita Mori’ (Think upon death), is made explicit by the skull. His Bible is open to an image of the Last Judgment, while the hourglass and candle, objects often found on a desk, are further reminders of the passage of time and the imminence of death” (Wikipedia).